If the words Intensive French Course sound intimidating to you… then rest-assured that an Intensive French Course at alpha.b is not as daunting as it might first appear! Our Intensive Course is just an extension of the Continuous Course, with the added opportunity to continue learning and practicing your French for 3 afternoon sessions per week with the help of our encouraging and supportive teachers. The Intensive Course requires that you have a level of French between A2-C1. Each class has a maximum of 10 students, so the teachers at b are able to be very attentive and can adapt to your individual needs. You can follow the Intensive Course from 1-24 weeks and the course starts every Monday from 07/01/2019 to the 20/12/2019. As your morning lessons will follow the same structure as the Continuous Course, they will focus on key aspects that will aid you in mastering the French language. For example: teaching and reinforcement of grammar rules; gaining new vocabulary; improved oral confidence; reading and listening comprehension and writing skills. As for the afternoon lessons, you will be able to reinforce the skills that you have learnt through practical application. You will discuss cultural, social, political and economic aspects of French life and depending on your level will tackle a variety of topics such as: opinion polls, debates, literature, history, theatre and music. I attended a typical afternoon session which was led by Boris. There was an extremely light-hearted and fun atmosphere in the classroom which confirmed that ‘intensive’ does not mean rigid or frightening at all! This particular lesson focused on oral expression and the theme was ‘racconte-nous une histoire’ i.e. ‘tell us a story’. The overall objective of the lesson was for each student to come up with various interesting stories and be able to present them to the class in a confident and coherent manner. Everyone received a sheet with more than 15 headings that could inspire such tales and brain-stormed independently for 5 or so minutes. After that, each member of the class took it in turns to present a story and thanks to the small class sizes – everyone was heard, and everyone received feedback directly from Boris! As with all of the teachers at alpha.b – Boris is a native-speaker which is fundamental for our students as they are able to pick up both grammar and idioms from someone who really knows their stuff! Overall, this was a very valuable lesson and it was evident that each student wanted to be there and was keen to learn and improve. 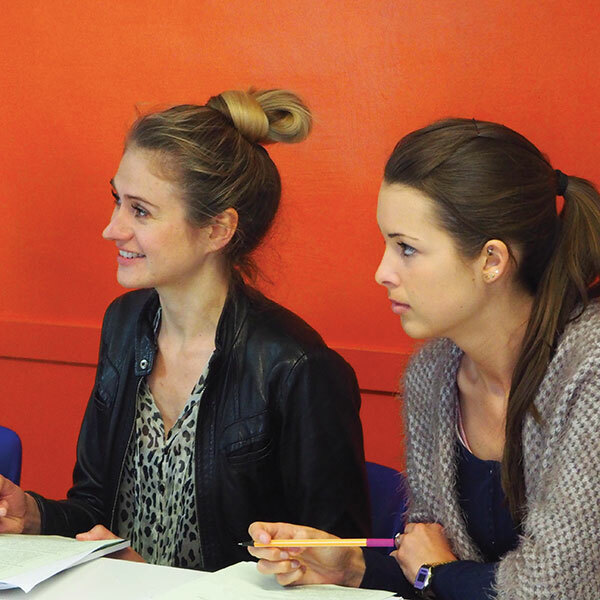 Following an Intensive French Course at alpha.b is a brilliant way to improve your French in the company of like-minded individuals from all over the world! Apart from the amazing academic aspects that the school provides (small class size and university graduate, native-speaking teachers), alpha.b offers a complete French learning experience. With the stunning backdrop of the Côte d’Azur, and its prime location in the centre of Nice, at alpha.b you can learn French whilst also benefiting from the Mediterranean way of life in a French-speaking environment. We also offer many activities that you can participate in after lessons, whether it be: trips to the near-by cities of Cannes/Monaco/Antibes; activities such as snorkelling and water sports or excursions to try the local Niçoise cuisine or brush up on your salsa skills – there really is something for everyone! What’s more – we have our own in-house accommodation service which enables you to find the perfect living arrangements whilst you are in Nice. You may wish to stay in a hotel or live with a French host family to make the most of your immersive French experience. Whatever your preference, we have many options that you can explore for your time at alpha.b.